Fresh from unveiling 25 cover variants of their latest issue, Empire Magazine released four new caps from the summer tentpole X-Men: Days of Future Past. 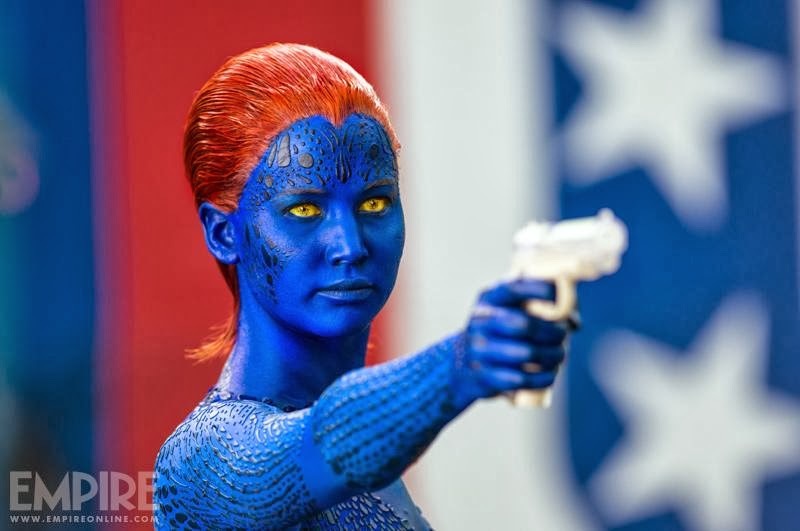 One-fourth shows zeitgeist queen Jennifer Lawrence back as young Mystique, menacingly pointing a gun and blending into a palette of stars and stripes behind her. X-Men: Days of Future Past is the big-screen adaptation of the beloved comic book saga of the same name. Mutants of X-Men movies past will congregate for the time-travel tale, from James McAvoy and Patrick Stewart's Professor X to Michael Fassbender and Ian McKellen's Magneto to Halle Berry's Storm to Hugh Jackman's Wolverine. Can't wait to get back to the future!